I've been so excited for this month to begin. Partly because I have quite a few treats for you guys this month. And partly because I'll be getting married next fall. We've been planning the nuptials for quite some time now, but because we have such hectic schedules, we decided to postpone the big day until after I've graduated. Even so, I've steadily been pinning some creative ideas to my Pinterest boards in anticipation of our special day. So, onto my treats. I'd like to share the joy of my almost wedding anniversary with you guys by giving you each a chance to win something special. 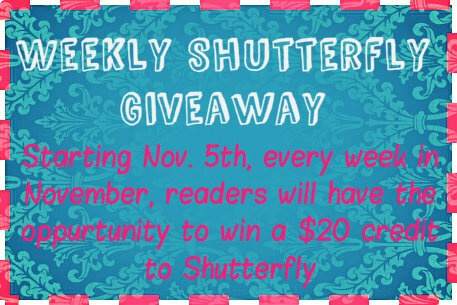 Starting tomorrow, November 12th, once a week I will be giving away a $20 credit to Shutterfly. That means you'll have four opportunities to win big just in time for Christmas! Pretty sweet huh? If you've never used Shutterfly, take a moment to check them out. They offer everything from photo books to customized photo fleece blankets. Which, by the way, make awesome Christmas gifts. 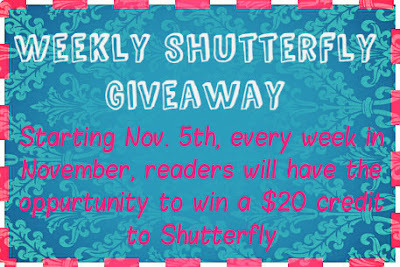 Check out the rafflecopter widget below to enter the first of the four giveaways. The only rule I have is to make sure that you are following ALL of the blogs listed on the widget. The rules are clear and simple. Be sure to follow them or else you will be disqualified. Also, please note, this giveaway is only open to residents of the US and Canada. And you can only win once. Sorry but I want everyone to have the opportunity to win. As always, thanks for reading, and a big THANK YOU to everyone who helped me reach 400 followers on my GFC last week. You guys are AMAZING.